A little over four weeks ago I twisted my ankle in a supermarket parking lot and managed to cause a hairline fracture of one of the small bones in my left foot. It’s healing, but not as quickly as I want. Of course I am the type who says “Lord, give me patience, but give it to me RIGHT NOW!”, so nothing ever heals fast enough for me. As a result of my mishap, my personal mobility has been restricted, and I am spending more time than ever in a seated position. With my mobility curtailed I seem to spend more time thinking about what it means to be mobile. And that turns me to thoughts about how Sage customers want to use applications in this very mobile world. At Sage Summit 2012 in Nashville, TN last August, we introduced a video that showed a day in the life of a Sage customer. It’s apparent to everyone these days that a typical workday is no longer just a 9-5 stint sitting in an office somewhere. I know I can’t live without my smart phone, and am rapidly becoming dependent on my iPad because my laptop seems so heavy in comparison. Most of my work day is still spent in an office, so if mobility is a necessity to me, how much more do sales and service personnel need tools to improve their work life when not chained to a desk? We’ve got a team folks working on the answer to that question right now in Sage ERP development. Based on the feedback we received from customers at Sage Summit and countless other one-on-one customer interviews, we’re developing two new mobile applications along with a companion integrated service that will be accessed via the web. The mobile service application will assist employees of service-based businesses such as pest control services track fees for those services and collect payment on-site directly from the customer. The mobile sales application will facilitate order entry for companies that bring and sell goods to customers rather than having customers come to them. And the companion web service will provide the account billing and payment for the two mobile applications in cases where services or goods are provided to customers ‘on account’ instead of via credit card at the time of sale. What’s different about the plan for these applications is, well, pretty much everything. They are being designed and deployed in very rapid cycles, nothing like the traditional 12-18 month cycles of ERP product development. They will be services that have a different customer deployment method than ERP uses, so part of the planning to roll out these services includes determining how to bill customers for the services, how to ensure customers are entitled to use the service, and how the services get terminated if customers fail to pay. This brings much change to the development teams in Irvine and Richmond, and a flurry of excitement that I haven’t really seen since we first started developing Windows applications. Just like then, there has been a major shift in the software industry. One could argue that we’re a little late to the table in making these changes; but we weren’t the first company to develop ERP and accounting software in Windows either. That just means we need to ensure these new products delight customers and solve their business challenges so customers will continue to look to Sage to help them solve those challenges. And these applications are just the first ones to take root in the Sage family; we’ve got lots more in the works for the future. Would you be interested in being one of the customers that the Sage staff talks with about business challenges to help us refine the plans for those future applications? We are specifically looking for conversations with “C” level executives; business owners, CEOs, CFOs; and those who are responsible for the growth of their company’s bottom line. If your company uses one or more Sage product and you have an interest in spending an hour or so with our team to discuss business ideas, either in person or on the telephone, please contact me. In the release overview of the Sage 100 ERP 2013 Initial Pre-Release Guide, you’ll learn that “The Sage 100 ERP 2013 release (formerly Sage ERP MAS 90 and 200 5.0) will focus on providing compelling value to existing customers, generate interest in the marketplace with new connected services and add-on solutions, and continuing to offer more deployment and pricing options. Substantial value will be provided to existing customers by addressing their top enhancement requests, Auto Updates for easy application of Sage 100 ERP Product Updates, enhanced Credit Card Processing using Sage Exchange, and more.” This blog sneak peek will focus on the credit card processing enhancements coming in Sage 100 ERP 2013.
Credit Card Processing in Sage 100 ERP 2013 will utilize Sage Exchange to provide many enhancements and increased flexibility including card-swipe capabilities, charges for repetitive invoices and Accounts Receivable invoices, mobile payments, improved cash flow management and forecasting, and will provide a consolidated view of payment activity. Sage Exchange is the cloud-based technology developed by Sage Payment Solutions that provides the integration between Sage 100 ERP and the Sage Payments Gateway. It consists of three key elements, the Sage Exchange Vault, the Sage Exchange Portal, and third party developer tools which enable Sage Development Partners to connect to Sage Exchange. The Sage Exchange technology includes connection to a secure vault for storing all sensitive credit card information outside of Sage 100 ERP, as well as for processing credit card transactions. 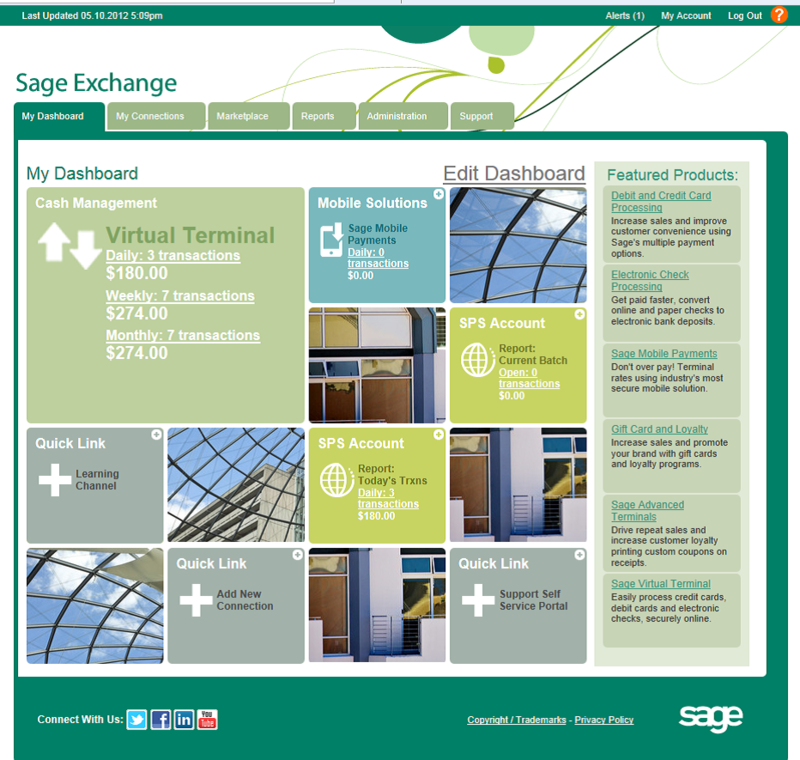 What is the Sage Exchange Portal? The Sage Exchange portal provides a user-configurable dashboard and flexibility to view payments information on the web via a tablet or desktop. Customize My Dashboard to gain access to the payments information you want to see. Assign access to the Sage Exchange portal for your employees, and easily establish connections to link employee’s tablets and mobile phones to Sage Exchange. Plus have 24/7 access to the Sage Payment Solutions customer support database right at your fingertips. Why is the Sage Exchange Vault important? The cloud-based vault helps to reduce fraud exposure by storing all sensitive cardholder data there rather than in Sage 100 ERP data tables. For added cardholder security, Sage 100 ERP 2013 will also allow a one-time use credit card for a payment transaction without saving credit card information. Customers migrating from previous versions of the software will be able to easily move their customers’ credit card information from their current location into the secure Sage Exchange Vault. The process will be streamlined for customers who are already using Sage Payment Solutions, so if you are using another processor now, it is highly recommended that you consider switching before you upgrade to Sage 100 ERP 2013. How will card swipes be integrated in Sage 100 ERP 2013? Sage Exchange will reduce merchant transaction fees when cards are present and speed the data entry process when swiping credit cards using a Sage Payments recognized USB card swipe device attached to the terminal. Our new card swipe capabilities have been truly integrated so that payments processing is built into the normal Sage 100 ERP workflow, which can replace the disconnected card swipe capabilities many companies use. 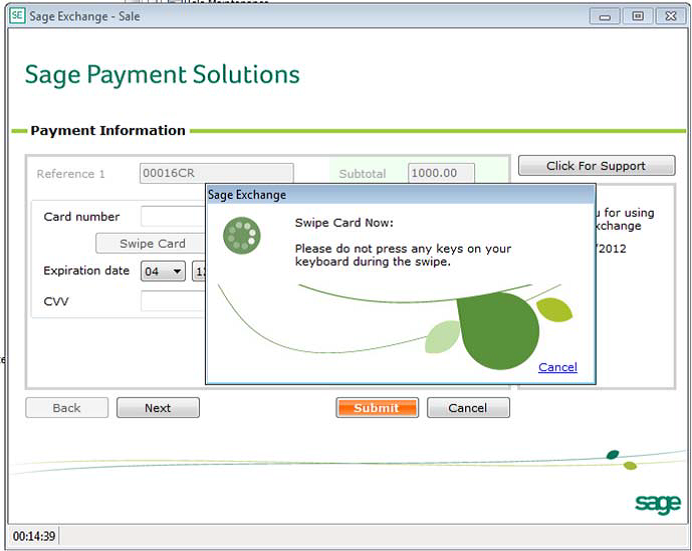 So, for example, when processing an order within Sage 100 ERP, after all line items are entered in the order and the clerk proceeds to the payments tab, after indicating that the payment method will be credit card, the Sage Exchange window pops up to allow the customer’s credit card to be swiped directly into Sage Exchange. But if the card isn’t present and the card number is already stored in the vault, the same workflow will allow selection of the correct customer’s card for retrieval from the vault. And if the order is being entered while the customer is on the phone, a card can be entered for one time use using the same workflow. It’s all been streamlined to be simple and fast. How Will Sage Mobile Payments be Integrated with Sage 100 ERP 2013? Sage Exchange will allow payments to be collected anytime, anywhere, via smart phone. Ideal for cash sales, Sage Mobile Payments will immediately capture the cash transaction information for a sale and send it to Sage Exchange, for secure transfer to Sage 100 ERP 2013 Accounts Receivable Cash Receipts Entry. A cash receipt batch will automatically be created for these mobile cash transactions which can be updated by accounts receivable personnel at the end of each day. Companies that provide services and collect fees in a mobile environment, such as mobile pet grooming, will find this functionality especially helpful. What other functionality will be available from Sage Mobile Payments? Sage Mobile Invoice Query, Pay and Post will be introduced in a Product Update shortly after the release of Sage 100 ERP 2013. This functionality will benefit companies with a mobile sales force that also collects payments on outstanding invoices. The software will include the ability to identify an existing Sage 100 ERP customer from the mobile device, view the customer’s open invoices, and select one of the open invoices to pay. With a Sage Mobile card swipe device connected to the smartphone, the salesperson can swipe the customer’s credit card and present the touch screen of the mobile device to the customer for signature approval of the charges. The credit card receipt can optionally be emailed directly to the customer from Sage Exchange. And, not only will the payment go directly into the merchant’s bank account just like any other credit card transaction, but it will also create a cash receipts batch within Sage 100 ERP to complete the financial transaction. What is happening with the PCCharge Payment Server Integration to Sage 100 ERP? 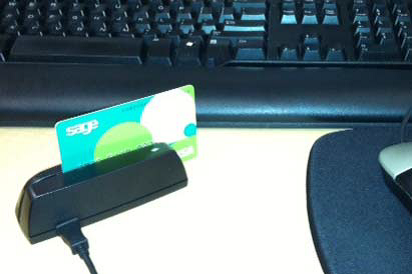 PCCharge Payment Server will no longer be integrated with Sage 100 ERP 2013. The way in which PCCharge was integrated with previous versions of Sage 100 ERP required Sage 100 ERP software to store credit card numbers. As detailed above, with version 2013, credit card numbers will no longer be stored within the ERP software, therefore PCCharge will not work. Also, Sage’s customer support department will answer questions about the ERP side of PCCharge for older versions of Sage 100 ERP through December 31, 2012. As of that time, Sage 100 ERP support for PCCharge will end. There’s something about spring that makes everyone in our industry start thinking about roadmaps. I don’t know if that’s because we used to hold partner conferences in May, or if it’s because many of our current projects are planned to release in the fall so everyone is wondering what’s next, or if it’s just something about spring itself that causes thoughts to gravitate toward roadmaps. But they seem to be on everyone’s mind right now. In my role as liaison between Sage Payment Solutions and all of the products in the Sage ERP product portfolio, my roadmap thoughts lean toward the integration roadmap for each of our products. So last week I hopped a plane and went to visit the Sage Payment Solutions team at their headquarters in McLean, VA to work collaboratively on a roadmap plan. Our goal was to gain agreement on what we expect to deliver to our joint customers in the months and years ahead. So how do we determine what to include in our joint roadmap? Well of course we look to feedback from our customers and channel partners that have been submitted in the Ideas website for each of the respective ERP products. But ideas in those sites lean towards ERP features, and don’t really touch on integrated payments functionality. So we look to see what competitors are offering. But that’s not too easy to do because we don’t really have ERP competitors that offer the full-service credit card and payment processing integration that is unique to Sage. So we look to other sources where Sage customers can go to obtain payment processing and related services; their banks. We researched the offerings banks have that mid-market customers would like to see integrated with their ERP system so they can improve efficiencies and reduce manual effort. One of Sage’s long-term goals is to be the one-stop shop for all payments related products and services, offering functionality that customers could get from their bank, but that they will prefer to get from Sage because of the unique integration with their ERP software that we provide and their bank cannot. – Is adding this functionality important for a full solution from single source? – Do we have a better chance to win and keep customers if we add this functionality? – Does it apply to both US and Canadian markets? – Does this impact the Sage image or reputation? Is it expected from the marketplace? – Will customers be willing to pay for this service or functionality? After this, we determined if it makes sense to move forward with further research and customer validation on the functionality on our list. So while we haven’t completely finished the roadmap process yet, we’ve made a great start and look to have something to announce at Sage Summit in Nashville this summer. Meanwhile, what functionality or service would you like to see on the Sage Payment Solutions and Sage ERP Joint Roadmap? Leave a comment below to share your thoughts. Does anyone really carry much cash anymore? I know I have a wallet full of credit cards that I can and do use just about anywhere: for groceries, gas, clothes, entertainment, restaurants and, well, pretty much everything. It’s easy and convenient for me to use a credit card as a consumer because it doesn’t require any knowledge about the credit card industry. All I really need to know is when I’ve got to make my payment. But as a merchant who takes credit cards in business to business or business to consumer transactions, a little bit of knowledge on the credit card industry can go a long way toward understanding how taking credit cards can help drive increased sales and how using credit cards as a payment method helps reduce your outstanding receivables . There are many players in the credit card industry besides the cardholder and merchant. There’s the merchant acquirer, the processor, the card associations, and the card issuer. And there’s those Independent Sales Organization folks (ISO’s) who seem to call you every other week trying to get you to switch your credit card processor. How do all of these players fit together in the process? We at Sage have put together some information to make navigating the credit card industry a bit more understandable. Click here for a link to a handy Infographic that explains a bit more about these different players. And, to learn much more, please join me and my Sage Payment Solutions colleagues for a webcast entitled “Payments 101: Making Sense of the Credit Card Industry” on Tuesday, April 17, 2012 at 11am PT. (1pm ET). To register for the webcast, click here. We’ll discuss the differences between an integrated and non-integrated payments solution, delve into the players in the industry and what each one does, and unravel a little of the mystery surrounding merchant fees. All Sage customers running any Sage ERP product are welcome to attend. After 20 years of working at Sage, the world’s largest provider of business management software and services for small and medium sized businesses, I seem to have become a bit of a ‘sage’ myself, gaining knowledge of Sage products, people and processes, both past and current. As a result, it’s time for me to share some of that hard-won knowledge with you, our loyal Sage customers, channel partners and other members of the greater Sage ecosystem. The goal of this blog is to spark ongoing dialog with you about topics that are near and dear to my heart, and give you some insight into what the Sage product management team has in store for the future. Sage has recently embarked on a transformational journey. As part of that journey, we’re changing the names of some of our established brands to be more reflective of the Sage brand than of the various product names of the past. For example Sage Peachtree is becoming Sage 50, Sage ERP MAS 90 and 200 is becoming Sage 100 ERP, and Sage ERP Accpac is becoming Sage 300 ERP. Along with these name changes, other Sage products such as those that provide fixed asset accounting and human resource tracking are also being renamed to emphasize the Sage brand name. Some question why this is being done, but to me the explanation is simple. Sage is the world’s largest provider of business management software and services for small and medium sized businesses, yet our company seems to be relatively unknown in North America by anyone other than existing customers. In order to attract more customers to our brand, prospects need to know who we are. In simplest terms, the Sage strategy is to move from a house of product names cobranded with Sage to a strong branded house, emphasizing Sage. Click here to see a video on the Sage branding changes. Those who know me may also know I’ve been the self-proclaimed “Czarina of MAS 90” for quite some time. “Why Czarina?” you may ask. My reply of course is, “Because Queen is so mundane.” Over the past few years my role at Sage has changed and is far from mundane. While my roots are with Sage ERP MAS 90 (becoming Sage 100 ERP) I’ve got much more than that product to talk about these days. Over the course of time I’ll update you on what I’ve been doing lately, what my colleagues at Sage are up to, and my observations on our industry and the future. When trying to come up with a name for this blog, I Googled my first name and discovered that two of the Scandinavian definitions of Erika are “ruler” and “forever”. So, with my longevity at Sage in mind and tongue planted firmly in cheek, Czarina Erika seems to fit. The “floating to the top” reference has to do with my long-time love affair with water activities including boating, sailing, sunbathing, relaxing in the hot tub, and yes, even synchronized swimming. And as a former swim instructor, one of the key instructions I gave to beginning students was, “If you feel like you are sinking, just relax and stop moving for a moment. Once you relax, you will float to the top.” So hopefully everyone who takes a moment to read this blog will also take the time to relax briefly, and use the information provided here to help them ‘float to the top’ and rise above the challenges of the day. Sage Summit 2012 – What a Week!